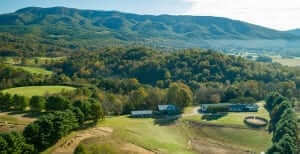 Virginia Estates specializes in finding, researching and brokering the sale of Virginia horse farms. Our dedication, resources, and diligence on behalf of our clients is unparalleled in the region. 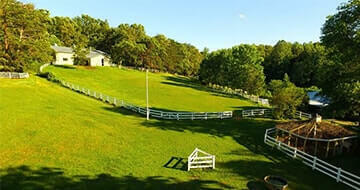 If you are considering buying an equestrian property browse through our listings below by area. Whether you are a private horse enthusiast interested in raising your family and caring for your horses in the clean air and lush countryside, a consummate equestrian professional looking to relocate your riding & training operations, a small business owner looking for a farm more suited to your needs, or all of the above, we can help you find exactly the Virginia horse farm that will meet your needs, desires and vision. Virginia Estates will partner with you and provide zealous advocacy throughout the rigorous process of scouting, researching, negotiating and closing. Our extensive experience and uncompromising thoroughness will directly lead to your ultimate satisfaction and peace of mind in your Virginia horse farm purchase. Our agents/brokers specializing in Virginia horse farm sales are part of the equestrian community and will be able to provide you with assistance in honing your vision for your farm, that is based on a working knowledge of all aspects of horse farms including (but not limited to): dressage, eventing, training horses, training riders, trail riding, facilities, indoor and outdoor riding arenas, cross country courses, jumping arenas, horse boarding, horse breeding, sales, horse leases, working student programs, hunting, horse shows, polo, rehabilitation, geriatric horse care and retirement with full care. Does the house appeal to you and your family as a home first? Is there enough space? If this is a historic property, has it been appropriately updated? If not, is a price break and a packaged remodel an option? 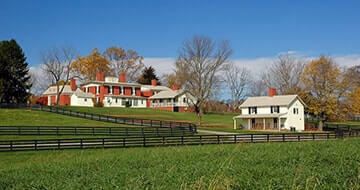 Virginia horse farms often feature historic homes that may need to be updated. Virginia Estates has long-standing excellent relationships with local building contractors and has frequently utilized these relationships to secure their clients high quality, timely, and extremely competitively priced renovation services. 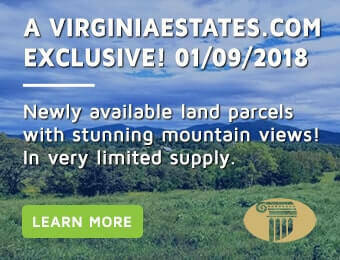 Tax maps can be unreliable, and because Virginia horse farms may contain hundreds or thousands of acres of land, it is especially important that any disputes, encroachments, easements, adverse possession, or other issues be unveiled before an offer is made. Even if such issues legally favor the client, Virginia Estates takes the practical approach that no buyer ever wants to be subjected to litigation, regardless of its validity. 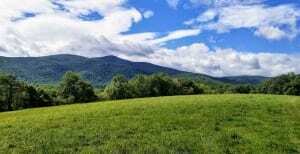 Understanding a prospective Virginia horse farm’s history, neighbors and role in the area is part of what sets us apart in working on a client’s behalf. No other measure is more important in providing your post-closing peace of mind or more complicated in assessing. We will take into account the house(s), Barns, other farm buildings, machinery/equipment to convey, timber, mineral/water rights, fixtures, roads, utilities, services, fence, gates, indoor and/or outdoor riding arenas, riding trails, heating, air conditioning, lighting, flooring, exercise equipment, tack rooms, pastures, cattle guards, etc. Additionally, we will provide you with well-researched conclusions regarding the pasture land, grass quality, necessity of hauling hay, presence of toxic plants, supply and quality of drinking water, water rights if irrigation is needed. We will walk the land and look for stuff horses can get into such as wire, glass, nails, dumps, metal and natural hazards like bogs, quicksand, jagged rocks, and lightning prone areas. The best agents/brokers must have knowledge of, consider, and keep straight a universe of diverse factors in assessing a horse farm. Virginia Estates is able and eager to do so on your behalf. When it comes to finding and purchasing horse farms, Virginia Estates has extensive experience in, not simply relying on other’s assertions, but really understanding the property that is being offered, what it’s pros and cons are, and how well it meets your needs and vision. If you are interested in beginning your search, please contact us and we can get started today. 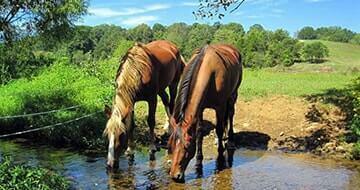 Search our website or virginia horse farms for sale for all sorts of new and great listing. There are many equestrian properties available for sale. 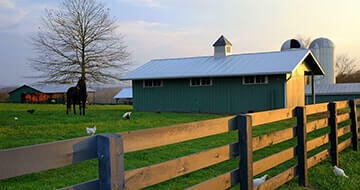 Virginia Estates discreetly represents horse farms and businesses located along the East Coast. 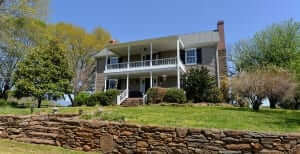 Please contact us for more information on these private listings. Due to the delicate nature of selling many of these properties owners chose to privately and discreetly market their property. 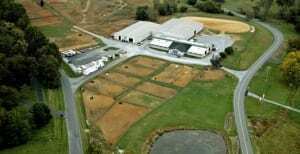 Virginia Estates works closely with a number of horse farms which are privately available for sale.